My husband and (two) children are some serious meat eaters. David? Notsomuch. Jack is a straight up carnivore. He sits and the table and, I kid you not, says, "I WANT MEAT!" 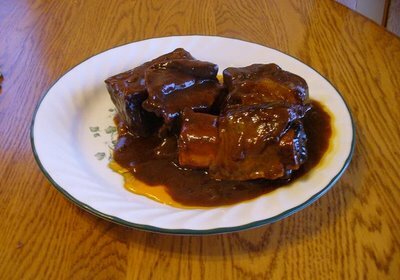 A favorite winter recipe at our house is some slow cooker ribs. There really isn't a "recipe" for this. I buy a package of beef ribs, and a bottle of barbecue sauce. Dump them both in the slow cooker, set it to low, and you've got some dinner. We usually eat them with some rice, whatever frozen veggie we've got, and some cornbread. It's a big, easy favorite with pretty minimal clean up. And usually no leftovers!